Liverpool will host Stoke City today in the 13th game week of Premier League at Anfield Stadium. 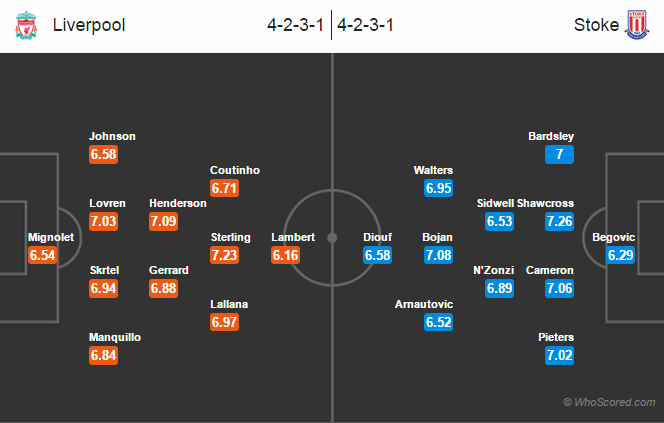 Liverpool flop summer signing Mario Balotelli is still not fit to play and Rickie Lambert is the likely one to start once again upfront. He has scored two goals in last two games. Philippe Coutinho, Dejan Lovren and Adam Lallana are likely to be back in the starting lineup after being rested in the midweek Champions League game. Daniel Sturridge, Suso, Jon Flanagan and Mamadou Sakho remain on the sideline. Meanwhile, the away side will be without Victor Moses, Robert Huth, Peter Odemwingie and Glenn Whelan but Erik Pieters is expected to return after missing the game against Burnley. Oussama Assaidi will watch from the stands as he is ineligible to play against his parent club. Liverpool have not recovered from the losing position this season in Premier League. Liverpool have been drawing games till the half time but losing in the end in their last three League games. Rickie Lambert has scored in three of his four BPL games against Stoke. 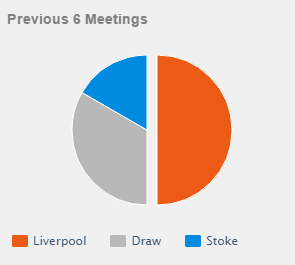 Stoke have not defeated Liverpool at Anfield in their last seven meetings. Jonathan Walters has scored four goals in six BPL games against the Reds. Liverpool 1 – 1 Stoke City.